In its 2006 Gallery, the journal Nature chose an image that spatially lays out different areas of science in a plane. It is a reduction of a large-format (42" x 43") paper print. 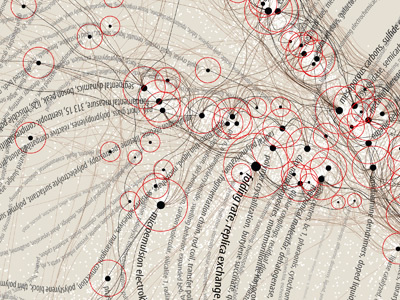 The map was constructed by sorting roughly 800,000 scientific papers (shown as white dots) into 776 different scientific paradigms (red circular nodes) based on how often the papers were cited together by authors of other papers. 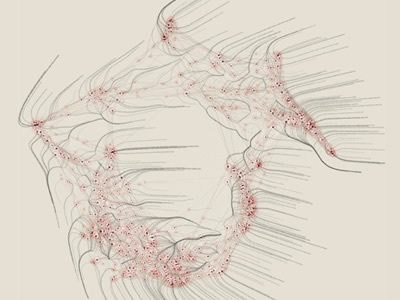 Links (curved lines) were made between the paradigms that shared common members, then treated as rubber bands, holding similar paradigms nearer one another when a physical simulation had every paradigm repel every other: thus the layout derives directly from the data. Larger paradigms have more papers. Labels list common words unique to each paradigm. This work was commissioned and partially supported by Katy Borner and the Places and Spaces: Mapping Science exhibition.